Connecting leaders to the company's shared purpose, values, vision, and strategy. Fortive is a Fortune 500 industrial holding company committed to providing their customers with essential technology. The company is comprised of more than 20 operating companies and focused on creating and delivering professional instrumentation and industrial technologies, Fortive has a diverse team of 24,000 employees worldwide. 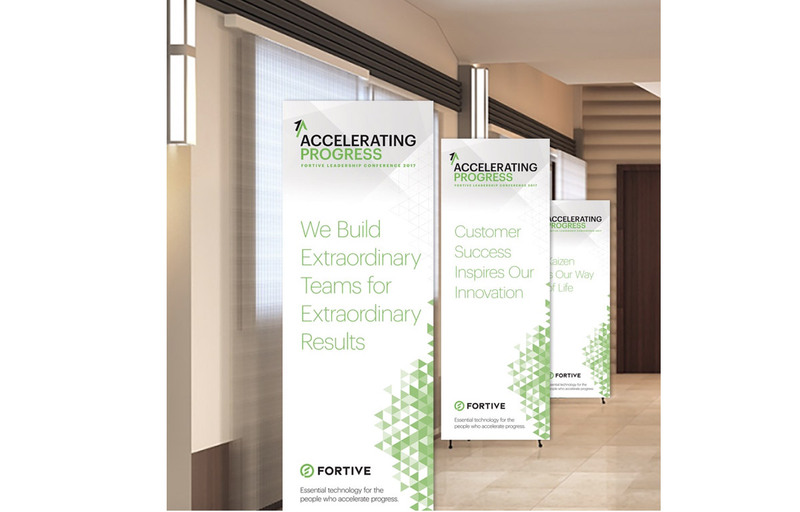 Every year Fortive holds a leadership conference, designed to bring together the top 200 global leaders across Fortive and its operating companies. 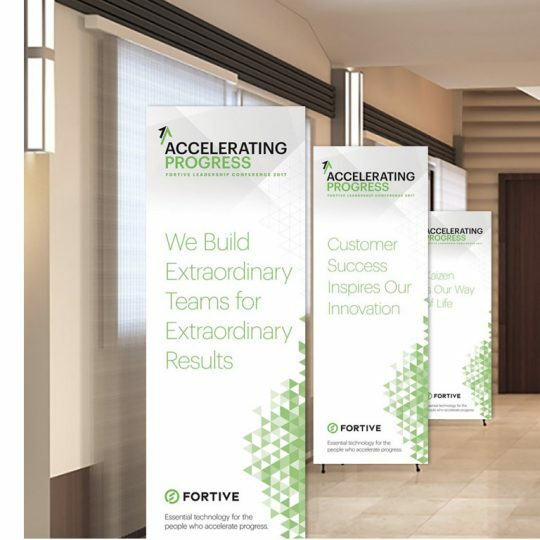 Fortive’s communication leadership was tasked with the planning and execution of the 2017 Fortive Leadership Conference — for which Vignette was tasked to help plan and create content for it. Click here to watch all of the conference and purpose series videos. Every event needs a theme to help connect speakers and attendees. Since this was Fortive’s first Leadership Conference, it made the most sense to base the conference theme around the company’s shared purpose. 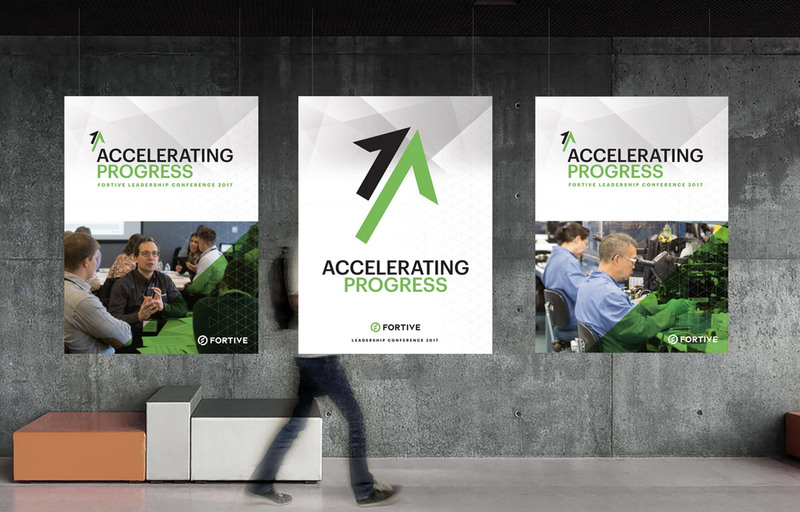 Fortive’s purpose statement is “Essential technology for the people who accelerate progress” so we decided to use Accelerating Progress” as our event theme, which communicates Fortive’s focus and position as an innovative leader in all its markets and businesses. Conference Branding: Building off the employer branding materials we developed when we first helped launch Fortive, we continued with a similar style of positioning and visuals, while finding areas to elevate and evolve based on recent employee feedback. CEO Keynote Presentation: Working closely with Fortive’s communications leaders and CEO (Jim Lico) we created Jim’s Keynote presentation — from the presentation outline to content development, key messages, presentation design, script notes, and rehearsals. Promotional Materials: We created promotional materials to be used for the conference ranging from banners and posters for the hotel lobbies and event rooms to the three (3) day conference agenda and supportive materials. Photoshoot: While we were shooting the videos we also took the opportunity to do a photoshoot across the globe to capture authentic, branded imagery for the campaign and eliminating the need for stock photography going forward. Fortive’s first Leadership Conference was seen as a great success by all 200 attendees. This three day conference left attendees feeling excited about the company’s future and helped better connect these 200 leaders to the company’s shared purpose, values, vision, and strategy. Our work on the videos specifically created great excitement amongst operating company leaders as they all saw the content we produced as the next step to helping them create more awareness around Fortive’s shared purpose and values, as well as to be used for Leadership and culture training going forward. Fortive and Vignette are continually planning, creating, launching and learning. 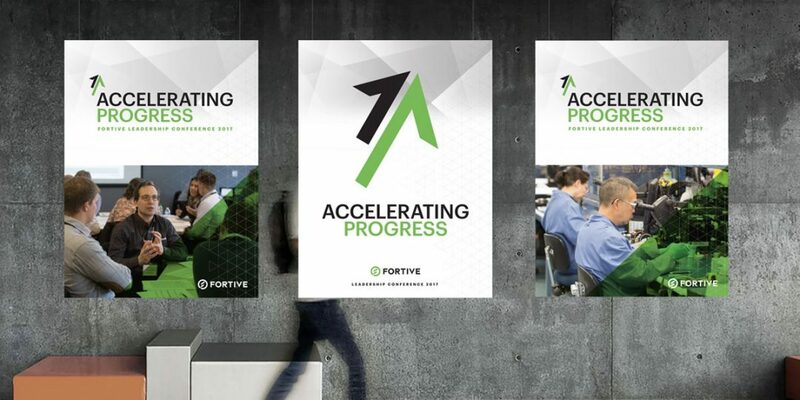 Fortive is built around the premise of continuous improvement, so we are never looking for perfection as much as driving awareness or action from the 24,000 global employees we serve. Need to create more awareness around shared purpose and values with your employees? Get in touch.